I work part-time from Wednesday to Friday. This year Christmas fell on a Tuesday. Should I get paid for Christmas Day, even though I didn’t work that day? What about New Year’s Day which fell on the following Tuesday? Christmas Day, St Stephen’s Day and New Year’s Day are public holidays. Christmas Eve and New Year’s Eve are not. All workers are entitled to paid time off or pay for a public holiday. (Your employer can decide whether to give you time off or pay.) Part-time workers must have worked for the employer for at least 40 hours in the previous five-week period to have a public holiday entitlement. If you work part-time and the public holiday falls on a day that you usually work you are entitled to a day’s pay or a paid day off for the public holiday. Part-time workers who are not rostered to work on a public holiday are also entitled to pay or to paid time off for the public holiday. This is one-fifth of their normal pay for the week as compensation for the holiday. In your case, you should get one-fifth of your normal weekly pay for each of the two public holidays, Christmas Day and New Year’s Day. So you should get the additional pay or the equivalent amount of time off. Your employer can decide which option to give you. If you have to work on a public holiday you are entitled to be paid at your usual rate and you are also entitled to either an additional day’s pay or a paid day off. You can get detailed information on employment rights from the workplacerelations.ie website. The HSE provides information and support on all your options, including continued pregnancy supports and abortion services on myoptions.ie. The My Options freephone line will be open from 1 January 2019 on 1800 828 010. 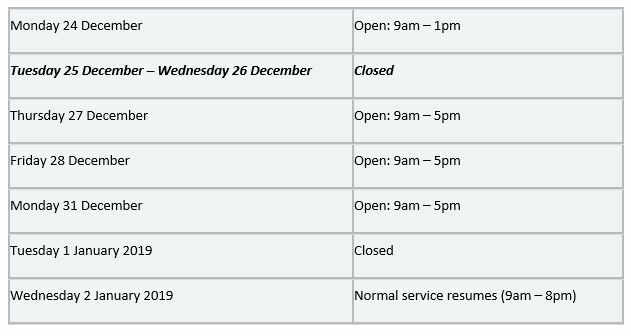 The Citizens Information Board will be closed on Tuesday 25 and Wednesday 26 December and on Tuesday 1 January 2019. Check with your local service. Check with your local Citizens Information Centre. Christmas Day (Tuesday 25 December) and St Stephen’s Day (Wednesday 26 December) are public holidays. Tuesday 1 January 2019 (New Year’s Day) is also a public holiday. If the public holiday falls on a day on which you do not normally work, then you are entitled to one-fifth of your normal weekly wage for that day. Part-time employees qualify for public holiday entitlement if they have worked at least 40 hours during the 5 weeks ending on the day before a public holiday. Read more about your public holiday entitlements. I’ve heard the law around drink driving changed recently. What has changed? Yes, the law around drink driving has changed. Since 26 October 2018, under the Road Traffic (Amendment) Act 2018, drivers who previously got 3 penalty points for certain drink driving offences will now be disqualified from driving for 3 months instead. It is an offence to drive in a public place if the level of alcohol in your blood, breath or urine is above the prescribed alcohol limit. There are different alcohol limits for new drivers and experienced drivers. New drivers are drivers with learner permits or drivers who have held a driving licence for 2 years or less, or people without a valid licence or permit. Previously, experienced drivers found with these levels of alcohol would be fined €200, and get an additional penalty of 3 penalty points. Now, these drivers will get the same €200 fine, but will also be disqualified from driving for 3 months. Can taxis charge higher fares over Christmas and New Year? Yes, taxis can charge more on certain days over Christmas. There are three different rates under the National Maximum Taxi Fare; the standard rate, the premium rate and the special premium rate. The standard rate applies from 8am to 8pm, Monday to Saturday. The premium rate applies at night from 8pm to 8am and on Sundays and public holidays. 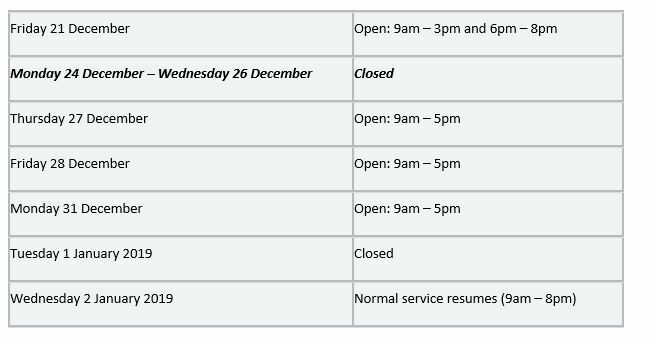 And the special premium rate applies between 8pm on Christmas Eve and 8am on St. Stephen’s Day and between 8pm on New Year’s Eve and 8am on New Year’s Day. The rates are lowest at the standard rate and most expensive at the special premium rate. So, taxis can charge more when the special premium rate applies over Christmas. Initial charge:amount which appears on the meter at the beginning of the journey. This is €3.80 at the standard rate and €4.20 at the premium rates. It includes an initial distance of 500m, or 85 seconds. Further travel:after the distance/time included in the initial charge has been exceeded, further travel is calculated on small portions of the journey. At low speeds, or when a taxi is stationary, the fare is calculated on the basis of time. The charges for further travel differ depending on what rate applies when you are travelling. The charges are lowest at the standard rate and most expensive at the special premium rate. Extra charge: there are strict rules about extra charges, including a booking fee, additional passenger charges and a soiling charge. You can ask for a discount before engaging a taxi. Drivers have the right to charge the maximum amount calculated on the meter, or a lower amount at their discretion. The Christmas Bonus is being paid during the week of 3-7 December 2018 to people getting long-term social welfare payments. You can read more in our Christmas Bonus document and find the rates of qualifying payments on welfare.ie. How are charities regulated in Ireland? The Charities Regulatory Authority (Charities Regulator) regulates charities in Ireland. It maintains a public register of charities and monitors their compliance with the Charities Act 2009. This Act sets out what an organisation must do to be recognised as a charity and the legal obligations for operating as a charity in Ireland. The organisation must first give the Regulator information about itself, so the Regulator can assess if it meets the requirements to be a charity. If the Regulator approves the application, it awards the organisation charitable status, gives it a Registered Charity Number and lists it on the charities register. You can search the charities register on charitiesregister.ie. It is an offence for an organisation to describe itself as a charity and carry out charitable activities, if it is not registered with the Charities Regulator. The Regulator can appoint an inspector to investigate a charity’s affairs. The charity and its trustees must co-operate fully and give the inspector all the relevant accounts and documents. The Regulator can choose to take a charity off the register – for example, if it fails to comply with its financial obligations or give the Regulator the information it requires. If you are concerned about a charity or its activities, you can raise a concern with the Charities Regulator. To vote in an Irish election or referendum, you must be on the Register of Electors. The Draft Register of Electors for 2019-2020 is now available. You can check it at local authority offices, Garda stations, libraries, post offices, or online at checktheregister.ie, until 25 November 2018. The new Register will come into effect on 15 February 2019. If you will be aged 18 or over on 15 February 2019, you should check that your name and address are listed and correct on the Draft Register. If there are any mistakes with your details, contact your local authority before 25 November 2018 to have them corrected. If you are not on the Register and you want to be included on it, you must fill in form RFA (pdf). If you need to correct or change your entry, you must fill in form RFA1 (pdf). If you are on the Register but your address has changed, you use form RFA3 (pdf). This will also remove you from the Register for your previous address. Read more about registering to vote.